ABSTRACT - The working paper deals with a recent EU social initiative - the Fund for European Aid to the Most Deprived (FEAD) -that from the RESCEU perspective, despite its narrow scope, can be understood as a puzzlingcase of “reconciliation” at the EU level. Launched in 2014 to contrast severe material deprivation, the FEAD was meant to represent in symbolic terms a way to both increase the visibility of EU action in the social field and to stem the harshest social consequences of the economic downturn.By focussing on this program,targeted to the lower tier of pan-European solidarity, the paper has two main goals. First, from a descriptive standpoint, it aims at providing an overview of the main institutional features of this novel component of the European social sphere. Interestingly the empirical reconstruction of the long process that brought about the adoption of the FEAD shed light on a peculiar historical pathway that took the form of a slow moving process of transformative yet gradual institutional change:not a big transformation in response to big shock, rather an incremental change with highly transformative results (Streeck and Thelen, 2005). Second, from an interpretative standpoint, the paper advances some preliminary hypotheses on the political and institutional dynamics behind the adoption of the new scheme, that appears puzzling on two fronts. On the one side, it represents an unlikely case of supranational activism in the social sphere in an expansionary direction, that occurred within a scenario of overall de-conciliation and econocratic negative integration (cf. Ferrera, 2014). On the other side, it affected a policy field – the fight against poverty and social exclusion – which is particularly unlikely to be Europeanized, since it is typically characterized by a strong defense of national sovereignty. Not surprisingly, findings suggest that the adoption of the FEAD resulted to be a contested and contentious decision, that fostered the emergence of harsh tensions. Despite this, the institutional and political sponsorship of the proposal proved to be strong enough to have the Commission’s initiative not only passed but even strengthened, in terms of scope and financial budget, during the legislative process. Curious about how social Europe is perceived in the media? The EUvisions observatory is the place to look! A new section is available on the website. 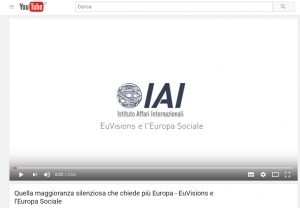 It is called Ideas Monitor, and it presents regular overviews of the public intellectual debate on social Europe, as it emerges from traditional media outlets, such as newspapers and magazines, as well as online publications and the wider blogosphere. More new sections will soon be available on the EUvisions observatory, stay tuned!